Since Nikon is known as one of the best camera makers, choosing between two Nikon products can be confusing. Two Nikon cameras that have been asked by people are Nikon D300 and Nikon D5100. The two seem to be comparable, considering that they both use APS-C CMOS sensors and optical viewfinders. However, there are also several notable discrepancies between Nikon D300 and Nikon D5100. 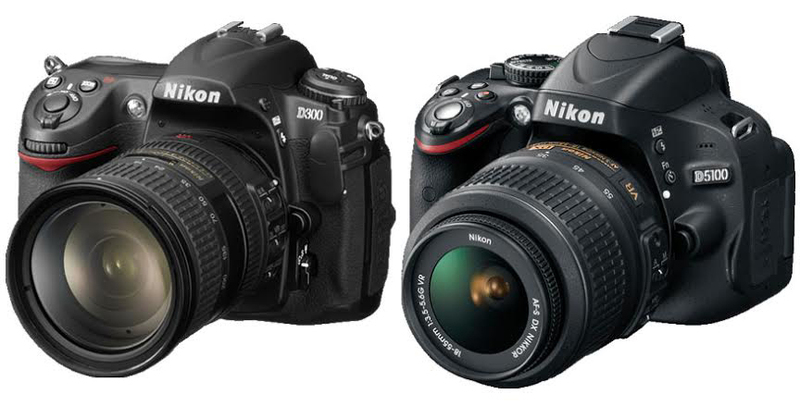 So, should you choose Nikon D300 or Nikon D5100? See the comparisons below for the answer. At first, Nikon D300 may seem like the better option in terms of design due to the housing being weather sealed. This is a very nice advantage if you often work outside. However, Nikon D300 is quite significantly bulkier and heavier, making it not very portable. And it has a 3” fixed screen. However, the true advantage of such professional camera lies on the dedicated buttons, which enable quick access to various controls. On the other hand, Nikon D5100 is a newer model that has been packed with more advanced designs and features. Nikon D5100 is notably more compact and lightweight, featuring a 3” articulating display screen for flexible shooting positions and selfies. Take a look: Nikon D300 vs. D7000. Nikon D300 is coming with a very nice pentaprism optical viewfinder, which promotes 100% coverage for better accuracy. In addition, it boasts in-body AF motor with 51 focus points, AF micro adjustment, 1/8000s maximum shutter speed, and 6 fps continuous shooting. However, keep in mind that Nikon D300 is solely for photography and not for videography – it doesn’t record videos. On the other hand, Nikon D5100 is only packed with a pentamirror optical viewfinder, but it is able to record videos with 1920 x 1080 maximum quality. It also has a mic port for recording the audio in high-quality. The maximum shutter speed is 1/4000s, and the continuous shooting speed is 4 fps. Nikon D5100 obviously comes with a more powerful sensor than Nikon D300. Nikon D5100 is packed with a 16 MP APS-C CMOS sensor, which boasts a maximum ISO of 6400, expandable to 25,600. Meanwhile, Nikon D300 is only armed with a 12 MP APS-C CMOS sensor. The maximum ISO is 3200, expandable to 6400. Overall, the image quality of Nikon D5100 is better than Nikon D300, with significantly better color depth, dynamic range, and low-light ISO performance. In general, a professional photographer would recommend you to choose Nikon D300 due to the dedicated buttons, excellent viewfinder, and powerful AF system. The dedicated buttons will give you full control over your camera. However, if you are more comfortable with the full auto mode, Nikon D5100 is the way to go.